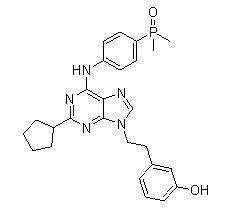 Remarks:AP23464 is a potent adenosine 5'-triphosphate (ATP)-based inhibitor of Src and Abl kinases, displays antiproliferative activity against a human CML cell line and Bcr-Abl-transduced Ba/F3 cells (IC(50) = 14 nM. AP23464 ablates Bcr-Abl tyrosine phosphorylation, blocks cell cycle progression, and promotes apoptosis of Bcr-Abl-expressing cells. Biochemical assays with purified glutathione S transferase (GST)-Abl kinase domain confirmed that AP23464 directly inhibits Abl activity. Importantly, the low nanomolar cellular and biochemical inhibitory properties of AP23464 extend to frequently observed imatinib mesylate-resistant Bcr-Abl mutants, including nucleotide binding P-loop mutants Q252H, Y253F, E255K, C-terminal loop mutant M351T, and activation loop mutant H396P. AP23464 was ineffective against mutant T315I, an imatinib mesylate contact residue. The potency of AP23464 against imatinib mesylate-refractory Bcr-Abl and its distinct binding mode relative to imatinib mesylate warrant further investigation of AP23464 for the treatment of CML.